Removing Spartina grass at Port Susan Bay. Photo by The Nature Conservancy. 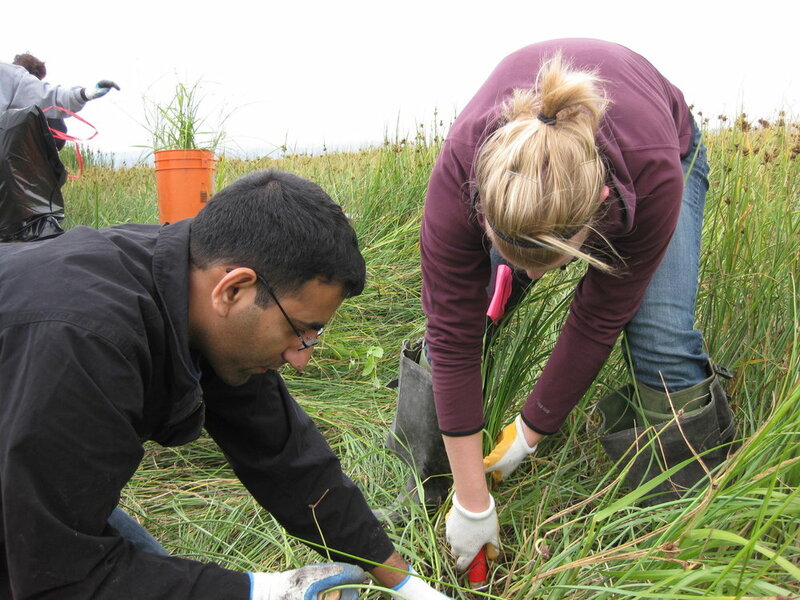 We are seeking 4 Port Susan Bay Monitoring Interns and 1 Crew Leader to conduct estuary vegetation monitoring at our Port Susan Bay Preserve near Stanwood, Washington. Ability to work long, physically-demanding days in the outdoors with a good attitude is a must. Experience with field data collection helpful, and canoe experience a plus. The crew will work closely with the Port Susan Bay adaptive management team to collect, process and organize vegetation and salinity data. Crew Interns: Dates: June 24 – July 26, 2019. Rate: $17/hr. Crew leader: Dates: June 10 – August 2, 2019. Rate: $21/hr. Brandon Nickerson of Port Orchard, WA, collects bugs from the waters of a stream ton one of our preserves. Photo by Harley Soltes. To apply, submit a résumé, at least 2 references, and a cover letter explaining what you want to do with your life and how this opportunity applies to that. Please send your materials to molly.bogeberg@tnc.org using the email title: “Port Susan Bay Crew Interns 2019” or “Port Susan Bay Crew Leader 2019” depending on the position you are applying for. Application deadline for all positions: April 12, 12 a.m. (midnight) PST. Our work on climate change involves scientists, planners and communities from La Push, Washington, to Liangshan, China. Welcome to "fancy science": Knee-high boots and a knee-length dress made for some interesting sensations trudging through the grasses and mud. What's a diatom and why does it matter for the food chain? Next time you talk a walk near a marsh, inhale that deep soil smell tinged with salt and know there are millions of little diatoms working hard to sustain a food web.